The Jews are known as the "People of the Book." 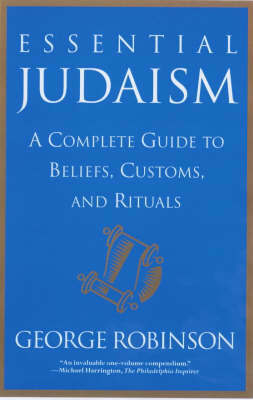 Even though a library on Judaism would fill mnay miles of bookshelf space, there has been no single comprehensive, hands-on volume that provides an up-to-date overview of Jewish practices and beliefs. Until now. For the Jew and non-Jew alike, ESSENTIAL JUDAISM explains not only what Jews do and believe, but why. In the process it answers such questions as; what happens at a synagogue service? What do the prayers and rituals mean? What is the Jewish calendar? And many more. With insight and clarity, George Robinson illuminates the Jewish life cicle at every stage, from birth and circumcision, to bar/bat mitzvahs, to weddings and mourning. He places over four thousand years of learning and belief in a practical context for living a good Jewish life in today's world. Michael Harrington The Philadelphia Inquirer An invaluable one-volume compendium. Diane Cole The New York Times Book Review Ambitious and all-inclusive, from practical information...to deeper, more abstract discussions. Morton I. Teicher The Jerusalem Post Extraordinary....Robinson deserves our gratitude for his major contribution.